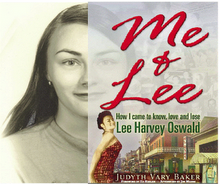 2/28/13 Meria interviews Judyth Vary Baker, on her excellent book “Me & Lee, How I came to know, love and lose Lee Harvey Oswald”. Did Lee Harvey Oswald kill JFK or was he a true American patriot? Lee was loyal, dual agent – they knew he wouldn’t talk and was indeed set up as a “patsy”; Lee was close to genius, Judyth a scientist with an IQ of 160; Book was written in 1999 and published in 2010 – why did she wait so long? It’s the missing link in the matrix; Judyth was granted political asylum along with her service dog; What this has cost her; the movie “JFK”; “911 wouldn’t have happened without JFK’s assassination”; the people working on the cancer-bioweapon to kill Castro; Hugo Chavez; The players: Jack Ruby, David Ferrie, Lee Oswald, Dr.Mary Sherman,Dr.Ochsner, Judyth, Clay Shaw and more; “truthtellers find each other”; Judyth was an innocent of 19 when she met Lee; the cure for cancer; Carlos Marcello; why did they kill JFK? Did Jack Ruby & Lee Oswald know each other? Did they kill Ruby with cancer? who paid Lee? Judyth’s been in hiding ever since with her life in danger; the History Channel and LBJ, Jack Valenti & Lady Bird Johnson; and much more. Meria HIGHLY recommends EVERYONE read this book. Your subscription gives you total access to the site 24/7. Be in the know and wake up! Subscribe today. 3 Responses to "Meria With Judyth Vary Baker – Me and Lee"
What a kuhrrrazy ride! I am still shaking my head, though NOT in disbelief, of course. I’m just amazed that she is still alive to tell-all!!! her story is one of the most amazing I’ve read about ever. She’s a very brave woman, and shockingly she is still alive!